Born Elizabeth Jane Cochran, Nellie Bly was one of the first and best female journalists in America and quickly became a national phenomenon in the late 1800s, with a board game based on her adventures and merchandise inspired by the clothes she wore. Bly gained fame for being the first "girl stunt reporter," writing stories that no one at the time thought a woman could or should write, including an expos&eacute; of patient treatment at an insane asylum and a travelogue from her record-breaking race around the world without a chaperone. This volume, the only printed and edited collection of Blys writings, includes her best known worksTen Days in a Mad-House, Six Months in Mexico, and Around the World in Seventy-Two Daysas well as many lesser known pieces that capture the breadth of her career from her fierce opinion pieces to her remarkable World War I reporting. As 2014 marks the 150th anniversary of Blys birth, this collection celebrates her work, spirit, and vital place in history. Nellie Bly was the pen name of Elizabeth Jane Cochrane (18641922), an American journalist best known for her record-breaking trip around the world and her controversial undercover investigation of Bellevue Hospital's insane asylum. Jean M. Lutes is an associate professor of English and director of academics for Gender and Womens Studies at Villanova University. Maureen Corrigan is the book critic for NPRs Fresh Air, a lecturer at Georgetown University, and the author of the literary memoir, Leave Me Alone, Im Reading! She lives in Washington, D.C.
"Absolutely fantastic...superb in its entirety"
"A classic from one of the first prominent female journalists in America." 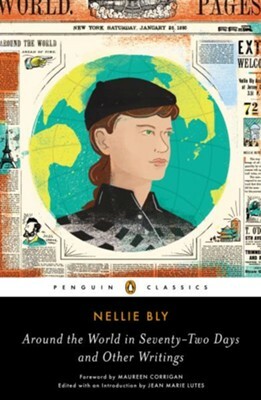 "Splendid...The only thing unbelievable about Nellie Bly is that its taken this long for her work to be recognizedand with a life story this rich, where is the biopic? Thanks to this new collection at least, Blys life work will be accessible for a whole new world of readers." "From the start, Bly is a natural writer. Her voice is caustic and confident, lilting effortlessly between the gush and private wonder of a schoolgirls diary and the rigor of the most celebrated political reporters of her time. " "If youve never read any of 19th-century journalist Nellie Blys work, this is the place to start. And if youre a longtime fan of the first girl stunt reporter, this is definitely a tome worth adding to your library&hellip;. [Bly] made indelible observations about a womans place in the world that are no less valuable today than they were 150 years ago." "The editing is outstanding, providing the backstory for this important but all too often neglected figure in American journalism." I'm the author/artist and I want to review Around the World in Seventy-Two Days and Other Writings.